Ontario, Calif. - Needing a win in their regular season finale in order to reach the Major Arena Soccer League (MASL) playoffs, the Ontario Fury fell 4-5 to visiting Southwest Division leaders Monterrey Flash on Sunday evening, adding to the familiar theme of narrow defeats to title contenders throughout 2018-19. 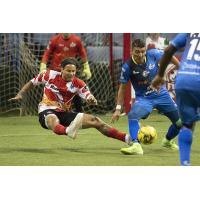 Flash midfielder Erick Rosas' two goal, one assist performance went a long way to seal the Inland Empire club's disappointment, which sees Tacoma Stars SC grab the second and only remaining postseason berth in the Pacific Division. Monterrey grabbed the early lead in the opening quarter, Edgar Flores slotting home from Brayan Aguilar, followed by a defensive miscue by the Fury that allowed Rosas to double his side's lead. 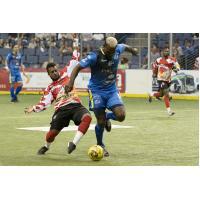 In the second period, the visitors picked up right where they had left off, as Rosas set up MASL-leading goal-getter Franck Tayou for a 0-3 scoreline. The home side finally showed a reaction shortly thereafter, ex-U.S. National Team star Jermaine Jones firing home on a ball off the boards by Evan McNeley. The tally visibly energized the Ontario players, who continued to push and were rewarded with a rocket across the frame and into the upper ninety by Anibal Echeverria, the helper going to Jones. The Fury would strike again after the break, as veteran Victor Quiroz tied the match at 3-3. After the Flash's Rosas subsequently put the visitors back in front via diving header on a beautiful flick by Carlos Farias, the fans at Citizens Business Bank Arena witnessed the ugliest moment of the game, as Ontario midfielder Marcus Jordan went down injured and had to be stretchered off with a possible broken leg. The remaining men in red, white and black battled on without their teammate and managed to equalize at 4-4 when captain Israel Sesay sent the ball into the penalty area and Maicon de Abreu found the net with a juicy heel flick. Monterrey had netminder Diego Reynoso and some luck to thank for not falling behind before the end of the quarter, as Reynoso tipped over a Jeff Hughes blast and Thiago Goncalves smashed an equally powerful shot off the crossbar. Ontario was punished for the missed opportunities in the most cruel of fashions in the game's final period, Tayou tallying on a deflected shot against the run of play. The hosts refused to give up after the gut-wrenching setback and forced two more outstanding saves from Reynoso. First the 30-year-old 'keeper brilliantly came off his line to deny a wide open Jones. Then he left his feet to parry a long-range Thiago Goncalves blast. While the Fury threw everything forward and made use of a sixth attacker for the majority of the closing stages, goalkeeper Chris Toth did produce an outstanding stop to keep his team in the game, leaving his line on a counter-attack to meet a streaking Aguilar. That set the stage for one last Ontario look, as Juan Carlos Gonzalez displayed some great footwork to put himself in on goal and test Reynose with a stinging blast from close range. Having missed the MASL playoffs in the past two campaigns, the Fury will look to learn from its many narrow defeats in 2018-19 and return to the knockout stages next season.